If you’ve read Blue Moon Vegetarian, you know why this photo depicts a milestone. If you’ve ever renovated a kitchen, you also know why it’s a milestone. For nearly three years, we’ve been working back and forth between a major kitchen remodel and the gutting and rebuilding of our master bedroom. Yes, 112 years of wallpaper stripped; yes, new mud on walls; yes, three layers of paint; yes, demo old island and move gas range; yes, gut pantry and start all over; yes, replace flooring and countertops. In the master, ditto the layers of wallpaper, ditto the floors, take a sledge hammer to the old closet and in-room shower, build a new walk-in—this last part thanks to the generous carpentry talents of my youngest son. Okay, so it isn’t quite 100% complete, because the backsplash still needs to go up, and the countertops still need work, but we did once actually order new countertops and got them into our house long enough to determine that they had been wrongly constructed and would not fit. So, the celebration over the kitchen is technical, but I’m calling it, nonetheless. In the bedroom, we still have one pass of the sander on the floors, still have to build a set of steps, still have to paint the trim. Three years scrubbed from a pair of mid-life lives. But in the process, we rid our living space of old, of rot, of mold. A cleansing, a restoration. In a way, writing is about restoration, also. Each new book breaks me down just a bit. The creation process can be cruel and grueling. Hard work through uncharted territory. My writing studio might as well be covered by jungle vines and exotic blooms. Once a book has survived me and my frantic approach to construction, once it has survived editor and designer and the great machine known as publication, only then to I start to feel the little building blocks of myself crave a return to order. By the time a story arises from its ashen beginnings, I can only hope I’ve given it wings enough to fly at least out of my sight. If it’s a failure, I don’t care to know about it. My reconstruction of order in my life falls way to a burial, whereby I submerge myself in writing the next one without taking the time to recover. This catches up with you. You find yourself making visits to Chinese medicine doctors for healing needles and potions. Walking into a fresh, new kitchen each and every bright new morning is nice consolation no matter what. Phil and I have an unspoken agreement about who does what work on house projects. It mimics the writing process. I do the big stuff—the ideas, the drafting, demolishing the old, building back anew. He does the finish work, the trim, the floors. Just like the editor, the proofreader, the designer, he does the buffing and polishing that makes all that coarse creation work stand high on its heels. He adds the spit shine, the sparkle, the stuff that makes everybody go Wow! Each morning I now walk into our kitchen and go Wow! 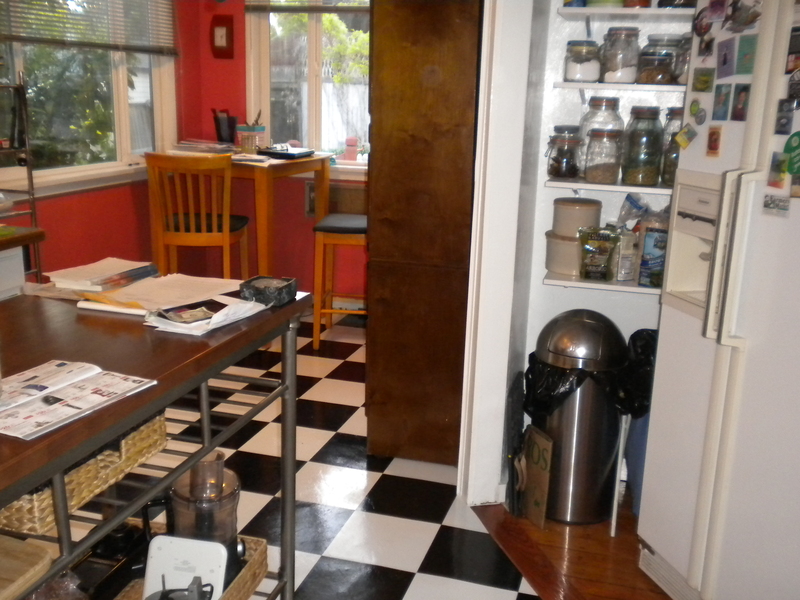 Occasionally he guts and redesigns a pantry all on his own. Which is a story for another day. Yin and yang. Push and pull. Destroy and rebuild. Desecrate and resurrect. Pull out the rot. Make room for healthy and new. Last month Dave Booda of Darken the Page was kind enough to do another interview with me about writing process, and we talk about this tearing down of self that has to occur. I hope you’ll take a moment to listen as we dive into some of the darker corners of my existence to see how this metaphor of breaking apart and rebuilding plays itself out again and again. It takes a certain amount of bravery to rip out what is no longer working. Dave, who lives and works in Los Angeles, is such an incredible interviewer that I willingly follow his lead, revealing details about myself and my life that I don’t talk about elsewhere. He helps me deconstruct, and by the time I’m coming out the other side, I’m the one who is restored for having looked at the rank and difficult. We talk about books. We talk about life. We talk about the spirit that winds us all together. I hope you enjoy. P.S. Dave makes reference to an earlier interview in which I reveal all about my third novel Guardian of the Sleeping, which I finished writing last year just as Blue Moon Vegan was being released. This interview went live last fall and was subsequently sent out to my subscribers. If you missed it, you can nestle a bit further back in your chair and listen to it, too. Total accident that in both cases our discussion wound its way to spirits and loss.